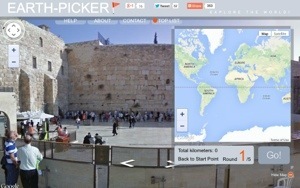 Earth-Picker is a web-based game that presents players with GoogleEarth panoramic images while in street view and asks them to place where they think it is on a map. What is great about this is that you have to use cultural and physical land clues as to where you think the location is. There are 5 rounds that provides a score. If players get stuck, they can click on the arrows to move around and perhaps find more clues such as a street sign that hints to a language used.